1. The practitioner asks the patient about his or her chief complaint and associated symptoms. 2. Based on this picture the practitioner confirms the diagnosis by asking seemingly unrelated questions about the patient’s temperament, likes and dislikes, sleeping patterns, and possibly diet. 3. The patient is then instructed to sit or lie in a position depending on where the cups will be applied. Cups are usually applied to large, flat body surfaces such as the back, but other limbs can be included depending on the need. 4. The practitioner ignites a ball of cotton held with tongs. With the other hand he holds a special cup at a slight angle near the patient’s skin. The burning cotton ball is inserted deep into the cup and then removed,and immediately the rim of the cup is placed fully onto the skin. The flame has warmed and expanded the air in the cup and suction is created as it cools, pulling toxins from the skin. 5. These cups are placed on the body for 5-15 minutes. 6. For the blood-letting portion the cups are removed and then slight superficial incisions are made to the skin. The air in the cups is reheated and this time venous blood is suctioned from the cuts. Up to 250ml of blood could be taken from the body per session. 7. Bruise-like welt marks remain on the skin where the cups were placed, but they disappear within 2 weeks. The cuts may take a bit longer to heal, often with minimal or no scaring. 8. People usually describe a sensation of wellbeing and lightness in the body following the session, but discomfort during the blood letting procedure is expected. Hijama is an ancient method of healing that dates back 281 A.D. Commonly called cupping, it is actually a combination of both cupping and blood-letting. 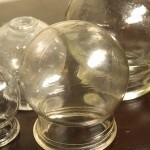 Cupping alone is the application of vacuum filled cups to specific areas of the body. Blood-letting is usually performed with cupping, although cupping is often performed without blood-letting. Blood-letting is the part of the treatment that drains the body of “excess” blood. Both methods provide their own therapeutic effects according to Eastern medical sciences such as Traditional Chinese Medicine, but the full hijama treatment is believed to be stronger in its effect. Nevertheless, blood-letting is not indicated for all people receiving cupping because it may be more than certain patients can handle. According to the energetic theory of the body, the body may have deficient or excess energy. Excess-type conditions would benefit from the draining effect of blood-letting, but a person suffering from a deficient-type condition may be harmed by the procedure. An excess condition, for instance, might be seen in a young man who has developed a strong barking cough, has a large robust body and full red face. On the other hand, a deficient type condition may be seen on a thin and weak elderly woman who complains of a chronic cold that she can’t get rid of. She may be a candidate for cupping, if it is indicated, but not for blood-letting. Why use these Ancient Methods? Despite Modern Medicine’s dismissal of the practice as crude and uncivil, cupping is revered for its healing capacity throughout the Far and Middle East. But does cupping genuinely work or have all these millenniums just been filled with false claims? Although these therapies were known to the Arabs long before the Islamic era, prophetic traditions promoting their practice may be one reason hijama continues to be widely used. Sayings such as “Blessed is a servant who practices cupping (hijama). It cleanses the blood, dries out internal inflammations, and brightens the vision,” and “Cupping (hijama) is one of the best medicines,” are just two among many in sahih hadith collections like Bukhari. Another possible reason for the continued use of hijama in the Middle East may be that it has become part of an Eastern cultural tradition which has been passed down over the years by various classes of people, from those with no medical training all the way to physicians. Formal training for the practice is rare and regulation is unheard of in the Arab World. So many people have seen hijama used in their own households that they feel comfortable enough to administer and likely teach the practice to their family members. In China, North America, Australia, and parts of Europe however, integrative practitioners that use cupping are formally trained in the practice and it is a regulated act. The practice makes sense physiologically, and this is perhaps the reason for the medical support it receives. Applying a vacuum to the skin and drawing blood can both stimulate the bone marrow to produce new, healthier blood, and both can increase blood circulation and decrease chronic pain in localized areas of blood stagnation. Nevertheless, these basic physiological explanations fall far short of explaining the incredible array of conditions that cupping has claimed to cure over the years. As such, it is fair to say that there is a lot to the body that we still do not understand and thus may have to learn from other paradigms that provide explanations such as the Eastern medicines that recognize energies as real forces acting within the body. Do not abandon any proven conventional treatments in favor of cupping. Avoid hijaama if you have a phobia of seeing blood, have a bleeding disorder, or are on anticoagulant therapy. If you decide to go the alternative route, find an experienced practitioner or ask about qualifications and training if possible. Do keep an open mind especially if conventional medicines are not helping as much as you would like.